If you want to improve your movie and television viewing experience, then buying theatre seats for your living room or media room is the way to go. Having a comfortable place to sit for the latest blockbuster, big game, or most recent episode of American Idol can make all the difference between enjoying a couple hours of fun entertainment and spending the whole time with an aching back thanks to subpar furniture that lacks proper support. 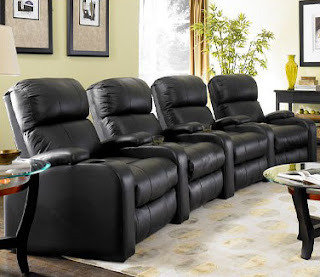 As you shop for affordable home theatre seating, you might be overwhelmed by the number of choices out there. Should you go with a recliner or a chaise lounge? Do you have enough space for an entire sectional or should you just stick to a couple of matching theatre seats? Before getting out your credit card, take a moment to review the following six home theatre seating tips. Make enough space. In general, the more space you have in your living room or media room, the better. Theatre seats are fairly large, so try to use the biggest room at your disposal. You might even want to shift other furniture around to reclaim more space in the main viewing area. Consider the number of viewers. Do you like to watch movies and sporting events with a group of friends or do you prefer to go the solo route? The answer to this question will determine how much home theatre seating you need to buy. Shop with your existing décor in mind. Ideally, your new furniture should nicely complement your existing décor. The last thing you want to do is buy theatre seats that clash with your carpeting or wall art. Look for a balance of comfort and support. Having the right balance of comfort and support in your chair, sectional, or love seat is crucial to the long-term enjoyment of your furniture. Sometimes a "comfortable" chair fails to provide enough support, and vice versa. Reading user reviews can help you find products that offer the perfect balance. Purchase the best quality you can afford. Home theatre seating will be subjected to a lot of wear and tear, so it would be a good idea to buy furniture that is made of durable, stain-resistant materials for lasting performance. Create a budget and stick to it. Prices for theatre seats vary greatly. They can start at a few hundred dollars for basic models and go all the way up to several thousand dollars for top-of-the-line units. To help ensure that you spend only what you can afford, create a budget and stick to it. Buying home theatre seating is a terrific way to make watching movies at home a lot more fun and exciting. By following the six tips listed above, you'll have a smooth shopping experience and can begin enjoying your new furniture soon.